The spoke and wheel pattern in nature can be seen in many forms and often is associated with movement with its central core radiating in spokes outwardly. The sea creature in the top left of the slide above, uses the shape for propulsion on its pursuit of caloric input. Movement is also attached to reproduction which the other two photos above display so well. The pattern of the spore print (bottom left) of a portabella resembles the human eye, another spoke and wheel pattern, and allows for the “seed” of the fruiting body or mushroom to release when conditions are set. For efficiency of dispersal, nature has employed the spoke and wheel pattern to increase edge and keep the portabella thriving. 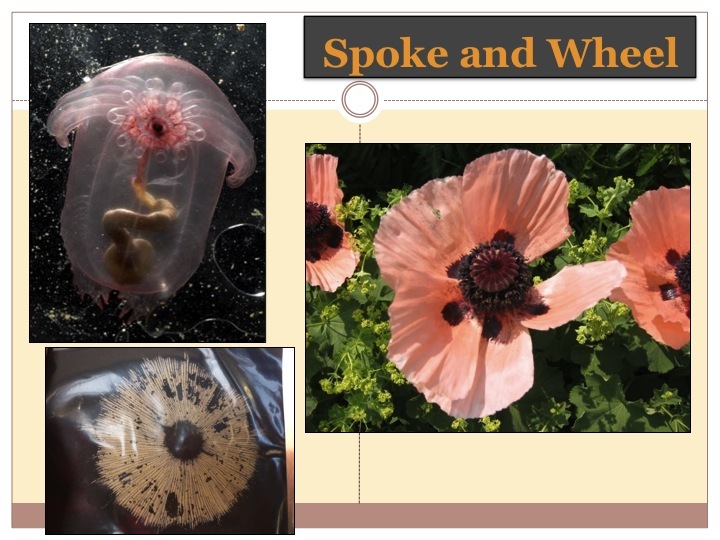 Similarly, the poppy flower also uses this pattern for reproductive motion. For those who have had the pleasure of growing the poppy plant, an ornamental and seed herb, we all know how many seeds come after this beautiful flower display. The spoke and wheel shape maximizes pollination as clumsy yet efficient bumblebees move through this tangled web of pollen. They spread genetic information and set the stage for this plants genes to move to the next generation, a truly remarkable gift of nature through pollinization. Remember it is through this shape, this orderly chaos that abundance comes and is an inspiration for many facets of development, from housing to information sharing as you will see below. Through its interconnected and radiating form efficiency and strength are born. I can say my overall favorite building I have ever lived in was a direct reflection of the spoke and wheel pattern (below slide). To bring efficiency in the design with materials and structural strength in an earthquake prone area, the self-taught builder John Kebbel employed pattern application beautifully. With its radiating spokes around a central wheel where a skylight was inserted, the space was well insulated, had great acoustics and felt sturdy but elegant. 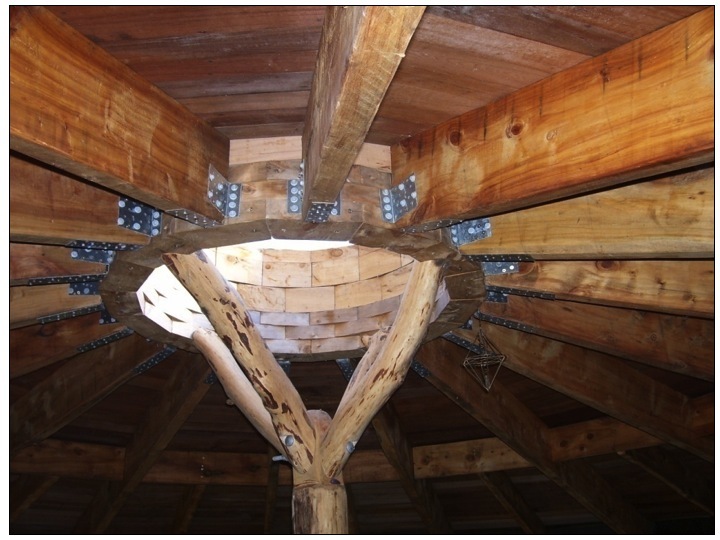 While conventional materials were used, an unconventional shape was procured through using natural materials in a cost affective approach. Just as nature provided efficiency with the pollination of the poppy, induced movement with the sea creature, and the structure for prolific seeding in the portabella, this house also reflects this pattern. The house has great flow and feeling, inviting its user for constant use, and eases the interface of indoor/outdoor space as the rectilinear form of conventional houses is lessened. Thus each side of the house was filled with light clay straw and plastered over. The rectilinear form fits well with this good insulator as it forms well to this type of construction. The plaster, laden thick with cob in the corners, gives the round appearance even though the hassle of round building contstruction was never there. 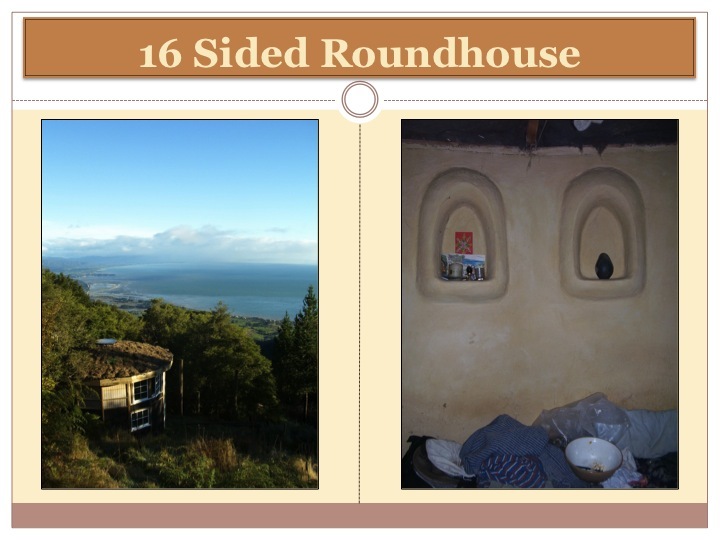 Round cob houses are great but we all know the amount of work that these buildings need and when you need a house with insulation rather than thermal mass this is a great option. The shape allows light to come in thus making it more energy-efficient by reducing electricity usage. It simply gave a great user experience, light, warmth, coolness, acoustics, and so much more! 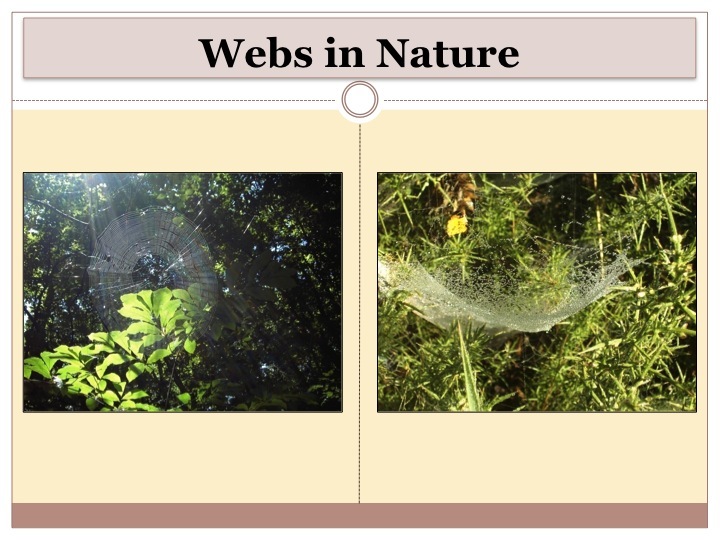 Webs in nature often also show this pattern and also of course augmentation due to different niches. Webs have incredible strength and ability to harvest energy from this edge in nature. They are organized to allow the spider to easily collect their prey and withstand forces from the elements such as wind, rain and passerby’s. It takes energy to produce it so of course the spider itself weaves as least as possible with the greatest output through this tried and tested. This concept lays a pattern way of thinking seen below in the graph, figure and picture. The bottom right figure above shows the concept of web of thinking. The central element is the earth itself and creates a radiating system out of how to organize thought. This allows us to see the layers of progressive thought ordered in way that is a natural pattern rather than a linear framework. Through seeing it in this framework the diagram becomes holistic with radiating spokes and division clearly articulating the layered message. from my time at the study abroad high school I taught at in 2007 in New Zealand for American high school students. One of the students, William, was autistic and his passion was natural structures with a rustic appeal. While we lived in a huge Scottish manor, he sought to build a structure that allowed the community to congregate outside yet protected around a fire thus creating a sacred space. So we sank some Macrocarpa posts in the ground and sourced the bamboo from a local Maori woman to build the structure. From there we harvested the thatch material known as razor grass which was quite an adventure full of scratches and screams. But the students came through and we had a community action day where we tied these rot resistant fibers with Harekeke, New Zealand Flax, strands into bundles and starting to assemble the “grass skirt” of the thatch. After one full layer at the bottom we realized that the structure was not strong enough. So we simply added some cross bracing at the top of the structure. While this may sound simple it shows that the more strands in your web the more resilient the system. Tracking these interactions and flows of energy on a permaculture design is a great tool to make sure the principles are being enacted and strength is following. 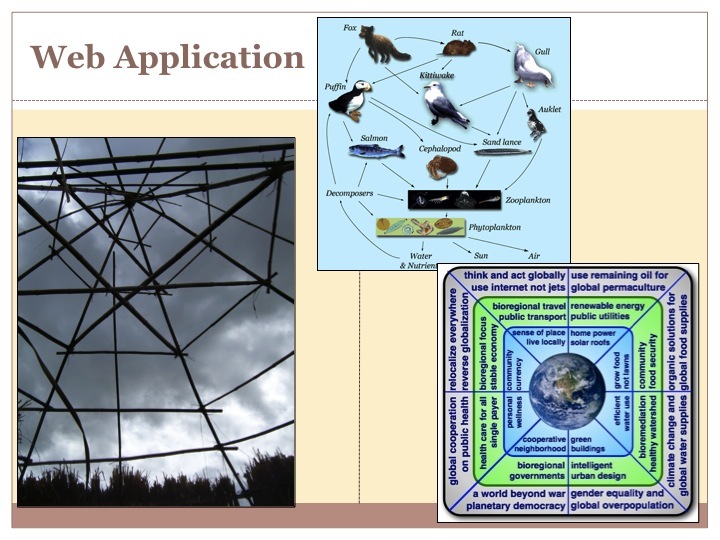 The energy of the web is transference and resilience, exactly what we need on our permaculture landscapes and the broader local and bio-regional community. environment through a lack of consciousness, the wolf was simply eradicated due to ignorance that if the wolf was killed off there would be greater deer populations. This may have proved true in the short run but quickly the mountain eroded as the deers’ behavior changed without the predators forcing the deer to herd intensely and always be on the move. They over and under grazed the mountain until it lay wasted and the deer populations naturally reduced themselves due to shortages of food and water. The same mentality continues today although the work of Allan Savory and Holistic Management shows another reflection of this pattern based thinking with sound decision-making practices and strategies like rotational grazing. A video in modern times that reflects the success story of wolves coming back is How Wolves Change Rivers from Yellowstone National Park. When we can see the interconnections, perpetuate them, great abundance is to follow.